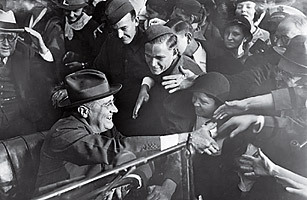 The President greets enthusiastic supporters in Warm Springs, Ga., on Dec. 1, 1933. March 4, 1933, was perhaps the Great Depression's darkest hour. The stock market had plunged 85% from its high in 1929, and nearly one-fourth of the workforce was unemployed. In the cities, jobless men were lining up for soup and bread. In rural areas, farmers whose land was being foreclosed were talking openly of revolution. The crowd that gathered in front of the Capitol that day to watch Franklin D. Roosevelt's Inauguration had all but given up on America. They were, a reporter observed, "as silent as a group of mourners around a grave." Roosevelt's Inaugural Address was a pitch-perfect combination of optimism ("The only thing we have to fear is fear itself"), consolation (the nation's problems "concern, thank God, only material things") and resolve ("This nation asks for action, and action now"). The speech won rave reviews. Even the rock-ribbed Republican Chicago Tribune lauded its "dominant note of courageous confidence." F.D.R. had buoyed the spirits of the American people  and nearly 500,000 of them wrote to him at the White House in the following week to tell him so. And that team came through brilliantly. In the next 100 days  O.K., 105, but who's counting?  his Administration shepherded 15 major bills through Congress. It was the most intense period of lawmaking ever undertaken by Congress  a "presidential barrage of ideas and programs," historian Arthur Schlesinger Jr. observed, "unlike anything known to American history." During the Hundred Days, F.D.R. took the country in a whole new direction. The 1932 election had been, in the words of President Herbert Hoover, not a "contest between two men" but one between "two philosophies of government." Hoover believed in small government and letting the free market operate. The Federal Government that Hoover presided over was stunningly limited in scope. Its entire budget was  fiscal conservatives, read it and weep  under $4 billion. Even as the U.S. endured the worst depression in its history, Hoover argued that the answers lay in unfettered capitalism and private charity. Roosevelt, by contrast, insisted that when people could not help themselves, government had to step in, "not as a matter of charity but as a matter of social duty." Roosevelt promised Americans a New Deal, though he was vague about what it would look like. At heart, he was a pragmatist, not an ideologue. During the campaign, he vowed to respond to the Depression with "bold, persistent experimentation." He was open to any ideas that might work. The immediate crisis involved the banks. Thousands had failed, costing families their life savings. The failures had prompted bank runs: people rushed to take out their money, causing more banks to become insolvent. By March 4, all 48 states had ordered their banks closed. Within days, the Roosevelt Administration drafted an Emergency Banking Act. Congress rushed to pass it, even though there were no finished copies available to read. The new law authorized the Treasury Department to begin reopening the banks when they could prove they were healthy. Barely a week after the Inauguration, the banking system was operating again. Roosevelt's closest aide, Raymond Moley, later said that "capitalism was saved in eight days." With the banking crisis resolved, Roosevelt was ready to begin rolling out the New Deal. In giving it substance, he got his ideas from the extraordinary men and women of his inner circle. At the urging of Agriculture Secretary Henry Wallace, a farmer and farm journalist from Iowa, F.D.R. backed a sweeping farm-relief bill. Prices had fallen so low that it no longer paid for many farmers to plant crops. As a way to prevent the crop surpluses that led to low prices, the Agricultural Adjustment Act (AAA) called, for the first time, for the government to pay farmers not to plant. Next Deal or No Deal?